For 2016, the Honda Odyssey gets a Special Edition (SE) trim that takes several features from the range-topping Touring Elite and puts them in a more affordable package. Otherwise, the Odyssey is unchanged for 2016. Let’s say you’ve got two kids and one on the way. Then your wife calls you. Surprise, she says — it’s actually going to be twins! Less dramatically, perhaps you and several friends want to get away for a weekend, but nobody wants to double the gasoline bill by taking two cars. Either way, you’re going to need the right vehicle. And for situations like these, there are few vehicles better than the 2016 Honda Odyssey. While a three-row SUV can also accommodate you and everyone else, the third-row seat is typically cramped, and luggage space is modest when it’s deployed. The Odyssey’s vast cabin, in contrast, ensures that both second- and third-row passengers will be comfortable, even if they’re adults. The second row is highly configurable, too, particularly on the EX trim and above — you can spread the seats apart to create more shoulder room or slide them around to open up more third-row space. Even with the third row in use, there are a useful 38.4 cubic feet of space in the rear to store luggage, strollers or whatever else you’ve got. But this Honda isn’t just about functionality. Even in its base trim, the Odyssey comes pretty well equipped with features such as a power driver seat, a back-up camera and separate air-conditioning controls for front and rear passengers. Additional creature comforts, including a touchscreen interface, a rear seat entertainment system and rear sunshades, are available on the higher trim levels. Another Odyssey hallmark is the way it drives. It’s far from being a sports car, but among minivans, it’s an agile handler, and its 3.5-liter V6 delivers quick acceleration and high fuel economy. As good as the Odyssey is, there are other minivans that are also worth checking out. The Toyota Sienna is fresh off a recent update, and it offers available all-wheel drive. 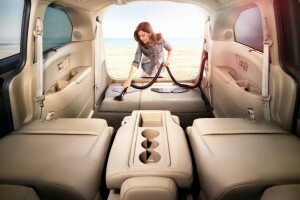 The Nissan Quest is smaller but boasts a smooth ride and highly configurable seating of its own. We’ve grown fond of the Kia Sedona’s crossover-inspired styling and front cabin during its long-term stay with us. You can also spend less and still get a fully functional van in the form of the Dodge Grand Caravan. But overall, Honda’s Odyssey remains a top choice for when your life is, for better or worse, begging for a minivan. The 2016 Honda Odyssey minivan is offered in six trim levels: LX, EX, SE, EX-L, Touring and Touring Elite. The base seven-passenger LX model is well-equipped with 17-inch steel wheels, rear privacy glass, a rear spoiler, manual two-zone air-conditioning, active noise cancellation, an eight-way power driver seat, a four-way power front passenger seat, a 60/40-split folding third-row seat, a tilt-and-telescoping steering wheel, full power accessories, cruise control, an 8-inch infotainment display, Bluetooth phone and audio connectivity, a rearview camera and a seven-speaker audio system with a CD player, Pandora compatibility, an auxiliary audio input jack and a USB port. Moving up to the eight-passenger EX model gets you 17-inch alloy wheels, automatic headlights, heated mirrors, power-sliding side doors, keyless ignition and entry, tri-zone automatic climate control, two-way power lumbar adjustment for the driver, a multi-adjustable second-row seat, a removable front center console, second-row sunshades and a conversation mirror. The EX also features Honda’s “LaneWatch” blind-spot camera system and an additional 7-inch touchscreen with HondaLink smartphone app integration (including smartphone-enabled Aha radio features). The SE includes a 115-volt household-style power outlet, an integrated vacuum cleaner, satellite radio and a rear seat entertainment system. The EX-L gives up the SE’s additional features (except satellite radio) but adds a power liftgate, forward-collision and lane-departure warning systems, a sunroof, a chilled storage box, leather seating (front and outboard second row) and heated front seats. Options include a choice of a voice-operated navigation system with an upgraded rearview camera or the rear-seat entertainment system with the 115-volt power outlet. These two systems can’t be ordered together on the EX-L. Step up to the Touring model and you gain 18-inch alloy wheels, foglights, front and rear parking sensors, driver memory settings, the 115-volt power outlet, retractable third-row sunshades and a fold-down armrest for third-row passengers. 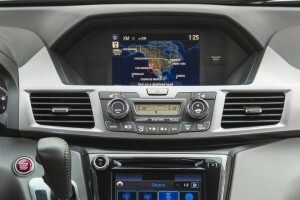 Additionally, both the navigation and rear-seat entertainment systems are standard. Finally, the Touring Elite adds xenon headlights, a regular blind-spot warning system (the blind spot camera is nixed), the vacuum, an upgraded rear-seat entertainment system (with a widescreen video monitor and HDMI input) and a premium 12-speaker surround-sound audio system with HD radio. 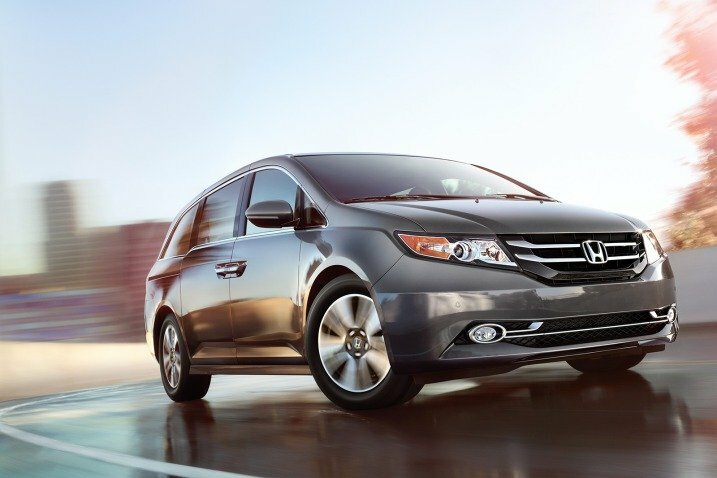 The 2016 Honda Odyssey is powered by a 3.5-liter V6 that produces 248 horsepower and 250 pound-feet of torque. Power is sent to the front wheels through a six-speed automatic transmission. EPA estimates are very good for a minivan at 22 mpg combined (19 city/28 highway), and we achieved close to 21 mpg in real-world mixed driving. At the Edmunds test track, a Touring Elite accelerated from zero to 60 mph in 8 seconds, which is about average for the minivan class. Properly equipped, the Honda Odyssey can tow up to 3,500 pounds. The 2016 Honda Odyssey comes standard with antilock disc brakes, stability and traction control, front seat side-impact airbags, side curtain airbags that cover all three rows and front-seat active head restraints. A rearview camera is standard on all models, with an upgraded multi-angle rearview camera available as an option on the EX-L and standard on the Touring and Touring Elite. Odyssey EX and above models come with Honda’s “LaneWatch” blind-spot camera system, but Touring Elite models replace it with a conventional blind-spot monitor. Forward-collision and lane-departure warning systems are standard on EX-L, Touring and Touring Elite models, though it should be noted that this collision warning setup lacks the auto-braking feature found in many similar systems. In Edmunds simulated panic-stop testing, an Odyssey stopped from 60 mph in 128 feet, slightly longer than average for vehicles in this segment. The Odyssey earned five out of five stars for overall crash protection in government tests, with five stars for total frontal-impact safety and five stars for total side-impact safety. The Insurance Institute for Highway Safety gave it a top rating of “Good” for its performance in the frontal-offset tests (both small and moderate overlaps) and the side-impact and roof-strength tests. It also earned a top rating in the seat/head restraint (whiplash protection) test. As befits a purpose-built people mover, the 2016 Odyssey’s interior offers a wide array of seating arrangements. Particularly noteworthy is the multifunction second-row seat that can be adjusted to create a middle aisle or side aisle for easier third-row access. On EX and higher trim levels, the center portion of the second-row bench can slide forward more than 5 inches to put the youngest passenger’s car seat within easy reach of mom or dad. The second-row outboard seats can also slide away from the center, allowing plenty of room for three car seats side-by-side. The Odyssey’s cabin has many other clever features, like the handy flip-up trash bag holder built into the removable center console, or the cooling compartment that means a refreshing beverage is always close at hand. The large touchscreen included on all but the base LX model also serves as a rearview camera display and provides access to audio system features, including popular apps like Pandora and Aha. The remaining controls are sensibly arranged and clearly labeled in a way that makes everything very user-friendly. Buyers who simply must have all the toys will gravitate to the Touring Elite model, which includes a rear-seat entertainment system built around a widescreen monitor that can play two different sources — a DVD and a video game, for example — at the same time. 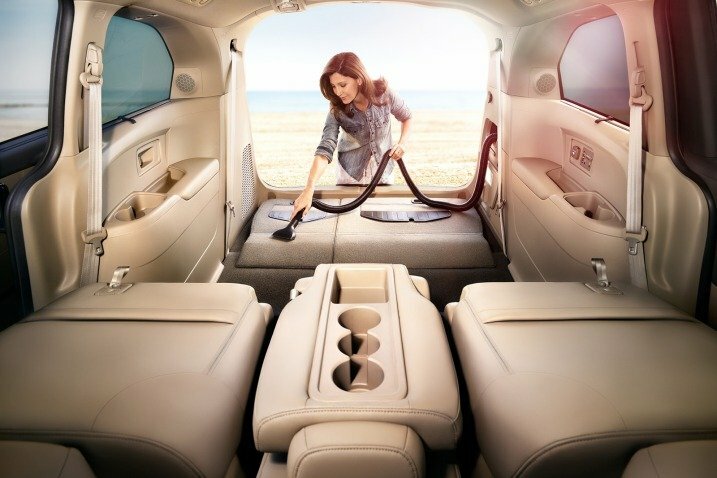 This top-of-the-line model (like the new-for-2016 Odyssey SE) also comes equipped with Honda’s unique built-in vacuum with a 10-foot hose capable of reaching crumbs in every corner of the cabin. When it comes to hauling things, the Odyssey’s cavernous interior is remarkably flexible. Even with a full load of passengers, there are still a generous 38.4 cubic feet of space behind the third row. Folding the 60/40-split third-row seat into the floor is simple and creates a 93.1-cubic-foot cargo hold behind the second row. The downside to the design of those second-row seats (55 pounds each) quickly becomes apparent when you discover they must be removed from the vehicle to make full use of the Odyssey’s 148.5 cubic feet of total cargo capacity. While the 2016 Honda Odyssey is technically down a few horsepower compared to rivals like the Toyota Sienna and Kia Sedona, these vans perform similarly in both our acceleration tests and real-world driving situations. The Odyssey’s V6 has more than enough juice to merge confidently on the freeway or overtake slower cars on the open road. Class-leading steering precision and confidence-inspiring handling make the Odyssey feel smaller and more carlike than it actually is. Thanks to active noise-cancelling technology, wind and road noise are held to pleasantly low levels, a difficult feat for what is essentially a big box on wheels.